Captain Pete’s Seafood Restaurant is an acclaimed destination for Holden Beach vacationers to enjoy a big seafood-centric dinner, a round of refreshing cocktails, and an outstanding waterfront view, thanks to the restaurant’s location directly under the bridge to the beach. 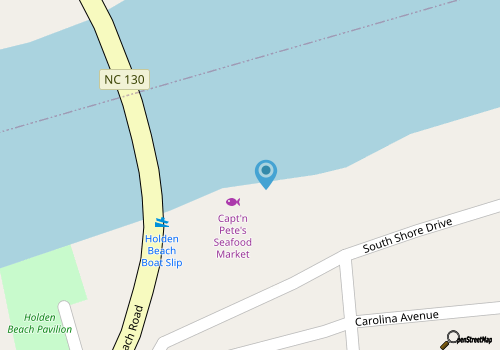 Easy to reach for both Holden Beach inland and on-the-coast visitors, and boasting a varied menu that takes a little creative license with coastal classics, Captain Pete’s is a must-stop destination for many food fans in the Cape Fear region. The menu features a wealth of lunch and dinner items, with a heavy focus on local seafood and southern fare. For lunch, patrons can dive into nice-sized fish tacos, an oyster po’boy, a lobster roll, or even a fried green tomato BLT, or can order a fresh salad, appetizer, or daily soup selection to whet an appetite. Dinner patrons will find a nice selection of entrees, (as well as a separate kids menu), which includes southern specialties like grilled pork ribeye and BBQ tuna, as well as more elevated seafood dishes like the Smoked Shrimp Ravioli or the Lobster Risotto with peas, tomatoes, and parmesan. With a nice array of options and an amazing vantage point under the bridge, Captain Pete’s Seafood Restaurant celebrates the coast, both inside and out. Call (910) 846-9988 for current hours.